1 - We are getting the Neptune on Friday!! Even the monsoons this year came late to let Aarav hear in the rain!! Yay!! 2 - Aarav now responds to his name quite well. Funny part is, that totally defeats the purpose of playing hide-n-seek now because when we try to search where he is hiding and call out his name, he comes running!!! 3 - Pots and pans and clang and bang and oh God such a lot of noise in the house now!!! He is now trying out different utensils to see the difference in sound probably. Not so sure about this, but he does select a new utensil every time. Maybe I should give him a choice between old and new ones and check if he really does select them for sound??!! 4 - Getting up in the mornings on his own?? Today morning, Aarav dint cry or call out to us when he woke up. He just woke up, no drama, simply got up and walked out to the kitchen searching for us. And then when he saw me, so stretched out his hands and asked me to pick him up!! This seems like a much better way to start a day!! I just wish I could put the harness on before he wakes up.. He simply hates the harness. The PSP is a bit heavy for his tiny shoulders. 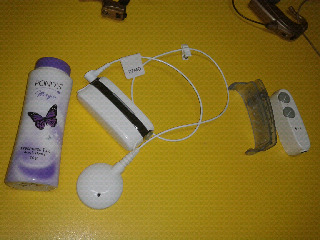 Aah.. 3 days more only.. Then we switch to the Neptune. 5 - Aarav's first introduction to birds!!! As I said before, Aarav woke up on his own today, so I dint get a chance of putting his harness on.. He likes the PSP machine and knows that he needs to be wearing it to hear.. but putting the harness on is a struggle. so I decided to distract him a bit till the harness came on. We went out on the balcony to see birds. Monsoon rains splashing in the backyard trees brings a lot of singing chirping birds to the house yard..
Indian Crows, Pigeons, Sparrows, Crow Pheasants (Bharadwaj), The green Indian ring necked parakeet (Parrots - these are not seen, but their shrill voice can be heard). Then there is the singing Koel (Koyal) bird, the wagtails and small tiny gray Finches and so many more.. The Indian striped squirrel also visits the ripe jackfruit that is so high up to remove that it still is on the tree..
All in all, a wonderful experience to see them interact, oblivious to our presence. Its like being in the forest, invisible to them. Today the pigeons and the crows seemed to have a rather loud disagreement.. probably a fight over food scrapes or nesting grounds.. I don't know, but I though it was a nice opportunity to introduce Aarav to these birds and put on the harness as well. So we went out on the balcony, the crows flew a bit higher in the branches and continued their calls. I asked Aarav to put on the magnet. When he did put it on.. the birds heard us talking and took a break. Suddenly a few of the Crows decided that their argument was more important than watching us so they started their crow calls as loud and dramatic as ever. Aarav heard the crow and watched stupefied at the crow who was shouting ... he let the magnet remain on to hear more..
Just a few seconds later he made that connection between the crow's call and his physical body language and understood the source!! His face lit up so beautifully!! The crow is a part of the Indian childhood stories right from birth. Kids grow up listening to Chiu tai (Little Sparrow sister) and Kau dada (Brother Crow) and their antics. And we never even noticed them!! This was the first time in 22 months that Aarav noticed the Crow. A milestone in his growth chart!!! 6 - Aarav knows that "Baba" mean dad. Sometime in this week Aarav wanted me to open a can of sugar and my hands were too full. I said "Baba na sang ja" (Go tell dad). And Kaustubh was not even around in sight to have picked up a visual cue, he was in the other room alltoghther. All I did was pointed to the room and said "Baba. Baba na sang" .. And Aarav understood. He walked to Kaustubh and got the jar opened. Wow. He recognized "Baba" and associated it as well!!! 7 - Aarav now says "up" when he needs to be picked up. EVERYTIME!! He knows that word too!! I refuse to respond in any way to his crying unless he "says" what he wants. aaaii aaaiii aaaii = "Khaali" which means down in marathi. I say UP / khaali for every step when we go up / down stairs.. He still does not know the distinction between up and down, but he knows that he should say something to make me walk..
humm + gesture = De. 8 - The 10th of August was Janmashtami, an annual commemoration of the birth of Krishna, the eighth avatar of Vishnu. Also known as Dahi Handi, where we celebrate a favorite antic done by naughty little child Krishna. He used to break the "handis" (earthen pots) filled with "Dahi" (home made yogurt) that were hung up high. So the celebration consists of making a human tower to break the handi that is at about 40 feet high!! 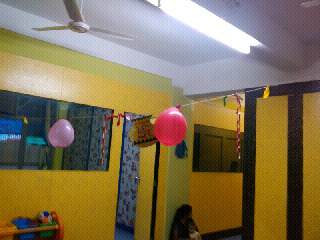 Aarav had Dahi Handi celebration in his daycare on the 9th of August. We dressed him up as Lord Krishna and they were told stories and they got the 'break' the paper handi.. well, take swipes at it at least. It was fun and the kids had a good time. Dahi Handi at Step up!! 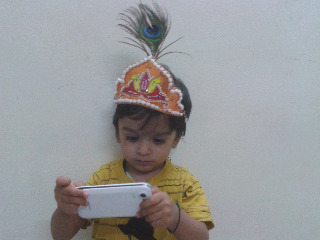 Aarav, the little Lord Krishna!! 9 - Spent the sunday in to Lavasa.. Kids should be allowed to get wet and it felt bad to pull his ears off every time it started raining. 10 - And last but not the least!! Neptune is here!!! Yay!!! Desperately waiting for the real one now!! !